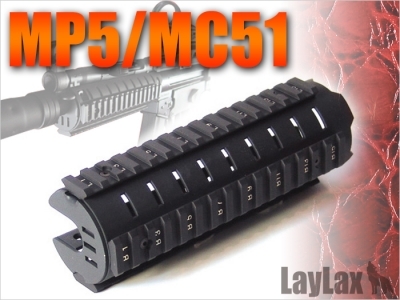 Laylax(Prometheus) Metal RIS Rail Handguard for MP5 and MC51. For Tokyo Marui MP5A4 / MP5A5 / MC51 and clones. Can hold Mini 8.4v NiMh (Type 03) or Mini 7.4v Li-Po (Type 20).